Of late I have wondered whether we are as seriously committed to bonsai as we make out to be. We sometimes lose focus and perspective somewhere along the line. Personally speaking, it almost happened with me. But my recent visit to Japan has rekindled & rejuvenated my enthusiasm for bonsai. Also, viewing the work of a lot of contemporary artists on the internet who are doing a lot of work in the field of bonsai has made me realise that I am not paying attention to details as they do in Japan and therefore in most cases my bonsai lacks in finesse. There is actually so much work to be done but in spite of having knowledge and experience, I have been unable to find the time to really work on my bonsai. 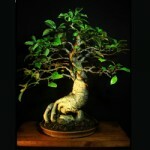 So, I feel that it is time to be more serious about the art of bonsai. I must pull myself up by the bootstraps and resume to concentrate and focus on bonsai and more importantly, try that little bit harder to work on my strengths, experiment a lot more in order to develop and consolidate my horticultural skills and artistic abilities in general and, keep updating my knowledge base constantly. I need to adapt this knowledge and skills to our local conditions & flora and put them to use through diligently working on my own bonsai because knowledge is nothing if not put into practice. It may be a long and hard way but to put it bluntly, “We must learn to sit before we attempt to stand; stand before we walk; walk before we run; and run, and run, and run before we can really run”. 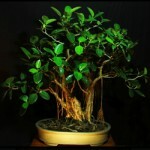 The therapeutic benefits emanating from the practice bonsai are indisputable and are an added benefit. To cut a long story short, I am renewing my efforts towards the creation, maintenance and refinement of my collection, utilizing the knowledge and experience gained through the years. I will also begin to share some cultural aspects in bonsai with you all and will continue to share it as and when possible, although I realize that to cover everything in a single article is extremely difficult. But nothing ventured, nothing gained. So here is the first instalment of that resolve. I humbly submit that I am indebted to masters and artists such as Kimura San and many other eminent Japanese masters, Harry Tomlinson, Dan Robinson, Jerry Meislik, Walter Pall, Peter Chan, Robert Stevens, Gedemerta, Budi Sulistyo, Ryan Neil, Bjorn Bjorholm, Michael Hagedorn, to name just a few and many, many others for sharing many aspects through their books, blogs, demos, etc. and, of course the numerous opportunities of the hands-on experience and the numerous discussions with my teacher Ratna Dave, eminent Bonsai Artist from Mumbai, India, and many other artists and friends from India and abroad. In fact, some of the points in this article have been incorporated from books and demo videos of some of the above masters and artists. It’s time to be more serious about Bonsai. So let’s delve a little deeper into the art and science of bonsai. But if your interest in bonsai is limited to a couple of plants placed in shallow containers for fun, don’t waste your time and read no further. Bonsai is not just about putting a plant in a shallow pot, pruning and feeding it from time to time and hoping for the best. It is also about maintaining the plant in a live and healthily growing state and in a manner which is aesthetically pleasing and will eventually, if not immediately, evoke the feeling and image of a majestic tree in an appropriate setting. This means that the cultivation of bonsai will require the deliberate use of pruning and wiring but in such a way that this human intervention is not noticeably evident anywhere. Also, it will need to be fertilised and repotted as necessary to help in its healthy and perpetual growth. Bonsai are any tree shrub, vine which are shaped to look like mature natural trees in nature and have to be aesthetically pleasing in shape and ideally look like their counterparts in nature. 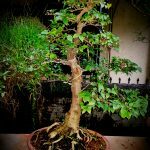 It follows that most of the plants selected to become a bonsai may not have these qualities and will need a cosmetic change or makeover to give the effect of an age-old tree and this is the aim of every bonsai design. 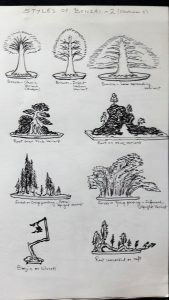 But in order to effect this cosmetic change to an aesthetically pleasing bonsai, it is necessary to have some ideals, some aesthetically pleasing shapes to emulate; these ideal shapes, defined by the Japanese bonsai artists of old, are called “Styles” and are based on the distillation of ideal trees shapes in nature. These styles are based on and recognizable by the movement and inclination of the trunk. 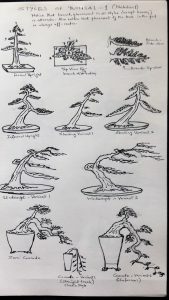 The main bonsai styles are i) Formal Upright (straight trunk); ii) Informal Upright (curved trunk); iii) Slanting (slanting trunk); iv) Windswept (branches moving in the direction of wind); v) Semi-cascade (trunk spilling over the upper rim of the pot); vi) Cascade (trunk spilling over the upper rim of the pot and extending below the lower rim); vii) Broom (branches spread out in all 360 degrees, from almost a single point on the trunk); viii) Root-over-rock / Rock-grown (roots sitting over a rock and continuing into the soil in the pot / rock acts like a pot to hold the roots); ix) Bunjin or Literati (trunk with acute direction change and sparse branches); x) Root Connected or Raft (single root system with branches forming multiple trees on a reclined trunk); & xi) Forest or Group planting (many trees in a single pot). 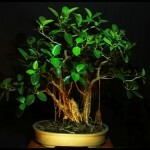 Apart from these, there are many other variations of styles, giving variety to bonsai. Positioning of the tree in the pot should be in such a way that the tree appears well-balanced and the pot itself should be in proportion to the tree. To design a bonsai of any style, it is necessary to have a basic aesthetic sense using the concepts of balance, proportion, form, line and apparent maturity as also knowledge of horticultural science to keep it alive and healthy. Aesthetic sense, although usually inherent and inborn in a favoured few, can be acquired through our own observation of impressive tree shapes in Nature and by drawing inspiration from them. This aesthetic sense can be applied to plants which are to be converted to bonsai through meticulous attention to detail and this constitutes the cornerstone in the complicated process of bonsai design. This natural sense which cannot be acquired overnight, has to be absorbed a little at a time and the absorption process can go on indefinitely. Horticultural skills, on the other hand, are a matter of learning and can be acquired through books, practice and experience. In most of the plants taken up for designing bonsai, especially in demonstrations, the shape of the trunk is more or less fixed. Even in nursery grown trees which have a certain amount of maturity, the shape of the trunk is almost fixed. We have to work with the variables, viz., the available branches and the pot. The designing of a good bonsai entails the visualisation of both its immediate and future shape and maturity, enhancement of its essentials and suppression of its defects, if any. Aesthetics demands that all parts of a bonsai – roots, trunk, branches and foliage silhouette must be cohesive and work along as a single unit incorporating the lead & follow principle (this aspect has been amply explained by me in my article “Perceptions and Perspectives in Bonsai Design” on my website “ruchabonsai.com”). If the bonsai appears as a cohesive unit, a critical design balance is achieved and maintenance of this balance should be the aim and an ongoing endeavour even in the developmental stages of the bonsai when the tree often changes shape and dimensions as it keeps growing fairly rapidly. The strategy for pruning and wiring should always fall in line with the lead and follow principle and must work harmoniously even during the periods of transition in its development and also when the tree progresses towards transformation into a mature bonsai. Primary branches should ideally emanate from alternate (nearly opposite but at a higher level) points on the trunk line, each successive branch balancing the branch immediately below it, with a back branch or two to give the impression of depth. The inter-branch distance will keep on diminishing as each successive branch becomes smaller, less developed and less elongated. Sub-branches along the primary branches should fork and divide often where each sub-branch and successive forking junction reduces gradually as the branches extend away from the trunk. Each fork will change the direction in which the sub-branch or sub-branchlet grows. In bonsai design since the trunk movement and inclination from the base up is the crucial factor in indicating its style, it should be clearly visible near the base and only partly obscured, if at all only near the apex. Foliage should neither be too heavy to avoid giving an impression of top-heaviness nor too sparse to avoid giving the impression of ill health. All plants will need light, water, air, food and warmth for sustaining their growth. The requirements of the above things, although vital, varies from species to species, but within each specie the requirements remain a constant factor irrespective of whether a plant is grown in nature or grown in pots. But since potted plants including and especially bonsai depend entirely on human intervention, their needs have to be met constantly in order to be able to grow them successfully. Pot culture plants and bonsai will always have a limited root-run and will grow more slowly than plants grown in the ground or over-size pots. In all species, the auxins present in the apical bud on the trunk and the buds on the outermost tips of all its branches regulate the growth; they will push the growth upwards and outwards laterally. This is known as apical dominance. However, the auxins in apical buds also discourage and supress the emergence of buds on the trunk anywhere beneath the apex and also the inner lateral buds along the lengths of the branches as long as they are active. So, as long as the auxin in the apical bud at the apex of the trunk is active, there is likely to be no branches or only minimal number of lateral branches or growth thereof. In order to induce back budding on the trunk or branches, if any, the apical growing tips will have to be stopped. This is usually done only when the required parts of the tree (trunk or branches, as the case may be) have developed sufficiently in thickness. The stopping or removal of the apical bud on the apex, when the trunk reaches the desired thickness (not to be confused with height), will activate the auxins in the dormant buds all along the trunk and on lateral branches already formed and cause existing branches to elongate; it will also induce back budding of the dormant or latent buds on the trunk in consequence of which new branches are also formed. [NOTE: This is possible because dormant or latent buds will always be present in every leaf axil wherever a leaf had grown on the trunk and branches irrespective of whether the leaf/leaves exist at the time of the removal of apical buds.] So, after these dormant buds get activated, those at the correct desired locations – preferably at alternate points along the trunk – can be retained to form the primary branches and the buds at the alternate points on primary branches (if they are present or when they are formed and elongate) can be retained to form sub-branches. Unwanted buds should be rubbed off or removed at the earliest so as to prevent dissipation of the trees’ energy in forming unnecessary branches. Once the required branches elongate to the desired lengths through the dominance of the auxins present at their apical tips, they in turn can be stopped or removed in order to allow the auxins at the dormant buds along the branches to form sub-branches and buds along these sub-branches can be activated in the same manner to form sub-branchlets and so on. This process will have to be repeated, preferably every year or every second year so that every set of new branches/sub-branches/sub-branchlets gets sufficient time to elongate up to the desired lengths and also lignify (forming waxy cuticles or woodiness) during the four or five growing seasons available to them. Tropical countries and regions are at an advantage in this respect because they are blessed with three distinct growing seasons per year: The Spring through Summer, the Monsoons and the brief period of October heat, whereas there is only one solitary growing season in all the temperate climate countries and regions. So, growth is extended to three seasons per year in tropical climates as against only one annual growth season in temperate regions. This difference has to be taken into account while pruning, wiring and fertilizing bonsai in the tropical climates. 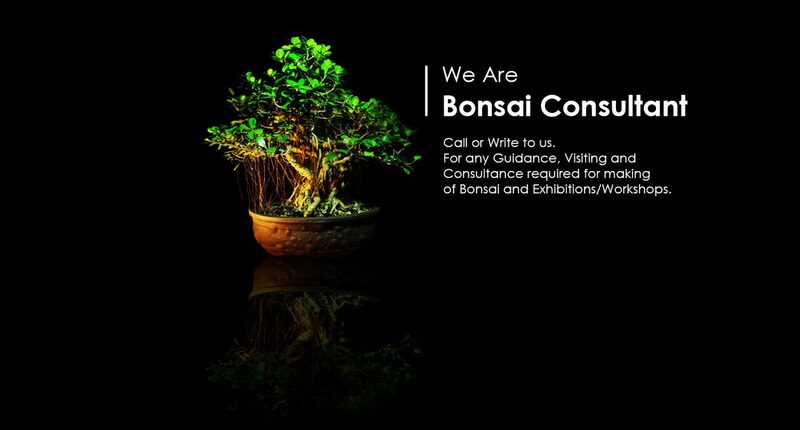 Bonsai should be provided with adequate or balanced amount of water and sunlight. Either excessive water or scanty water will cause the plant to slow down its growth. Timely and moderately heavy fertilizers are necessary to keep the bonsai growing healthily. Bonsai can also be designed and pruned by the technique of what has been termed as reduction building by David Fukumoto of Hawaii. Reduction building presupposes a plant which is in an advanced stage of growth & development of branches. In this technique, a plant is pruned back or reduced to its lowest workable branch which in turn is reduced to the next workable sub-branch and that again is pruned or reduced to just above to the lowest lignified sub-branchlet. This sub-branchlet becomes the apex after this severe reduction pruning and becomes the basic structure on which the design of the bonsai is built. The process can be done at one go if the plant has multiple branches and is mature enough, but can also be done in progressive stages if the plant is yet to develop sufficiently in which case the pruning of the next stage is postponed till the plant develops and grows profusely and throws out more branches to build or rebuild its structure. The process is repeated as required, either every year or every other year depending on the rapidity of its growth and the structure and design of the bonsai is developed as required. 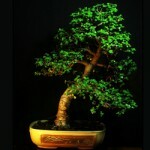 Refinement of the bonsai starts preferably only after the desired structure is achieved. Only minimal wiring may sometimes be necessary in order to influence branch and growth direction. Bonsai which grow healthily will need to be pruned from time to time. 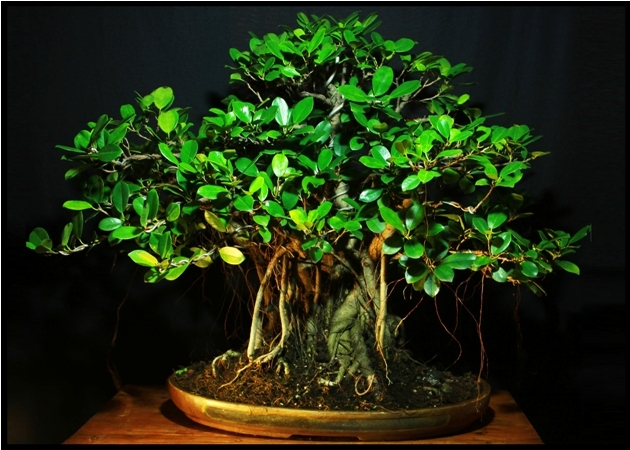 Pruning is sometimes called Definitive pruning (when initial shape is given to an already mature or collected plant), Formative pruning (when the form is developed by pruning repeatedly) and Refinement pruning (when pruning is done to maintain or refine the shape of a plant) according to the role it plays in the development of a bonsai. When the tree is in its initial stages of development, it has to be allowed to grow as much as possible to increase trunk girth and thickness of its branches. Meaning that as long as the tree is developing in girth, branches and till it achieves the desired height, trunk and branch thickness it will have to be allowed to grow unchecked and pruning will play only a minimum role of corrective pruning, if necessary. Consequently, in the developmental stage once the primary branches are decided and unnecessary branches are removed, the bonsai is not pruned unless a directional correction is required or a branch higher up on the trunk is overtaking the lower branches in terms of thickness. In such a case only this excessively developing branch is pruned or sometimes removed completely if it is not conforming to the shape and design that the grower had in mind. Sometimes, one or two branches lower down and at the back of the trunk are allowed to grow completely unchecked as a sacrifice branch/es in order to develop the trunk girth even beyond the initial growing stages of the bonsai. Heavy fertilization will be required during these stages. It should be particularly noted that good growth depends on the production of food (sugars and carbohydrates) by the leaves and increase in thickness of the trunk and branches depend on the exchange of this food, water and nutrients between the roots and the stem & branches. Increase in the girth of trunk and branches is therefore directly proportional to the amount of foliage on the bonsai. Consequently, since pruning results in removal of a certain amount of foliage which will slow down growth it has to be offset by supplying nutrients the year round, especially since pruning can be undertaken in any of the three growing seasons in tropical climates to enable the bonsai to create a store of food to encourage growth of new foliage as early as possible after the bonsai is pruned especially during the secondary growing season post-monsoons. Severe pruning or bare-pruning (no leaves are left on the plant after pruning), should be carried out preferably only in Spring to allow for an extended rowing period for putting out greater amount of new leaves and should preferably also be heavily fertilized beforehand. Once the desired thickness of trunk and branches is achieved, the bonsai will have to be pruned periodically in order to develop new branches, new growth on sub-branches and also to develop ramification on both branches and sub-branches. The intensity and frequency of pruning will depend on whether the bonsai is under development of ramification or under refinement of the ramification. Consequently, although due to the difference in the growing cycles, bonsai in tropical climates can be pruned as well as wired at any time as required once they lignify, the effect of the time factor in pruning is all the more evident due to the higher rate of growth. More attention needs to be paid to both timely pruning and timely removal of wires the year round. In bonsai, due to the limitation of the pot size, the healing of the pruning wound is slower than that of trees grown in oversized pots or the ground. During Spring and Summer, healing is faster as most of the trees are in active growth. In the beginning of Spring pruning will induce back-budding in all the areas below the cut due to the beginning of the growth season as the food stored up during the dormant season is utilized. In Mid-Summer when the trees’ growth is already in full spate, a ring of new shoots is likely to spring from around the pruning wound and further back along the trunk or branch, to a lesser extent as the high amount of plant food manufactured due to higher level of sunlight and photosynthesis due to increased daylight time). If pruning is done in late Summer, there is less back-budding along the trunk and branches and shoots are likely to remain shorter and sometimes stop altogether due to excessive heat. However, growth of these very shoots initiated by Spring and Summer pruning is resumed due to again the high food production because of the transmission of atmospheric Oxygen (O2) and Nitrogen (N) to the soil during monsoons. Pruning in the tropical climates is possible even in the Monsoons due to this availability of atmospheric O2 and N. After the monsoons are over there is a brief spell of rising temperature, generally in October (known as October Heat) and pruning of over grown trees can be carried out during this period also, since Winter, not being as severe as in temperate climate regions, is not a factor inhibiting growth. Root growth is also optimum till the end of monsoons. Practiced by the Chinese and now adopted by many, it advocates the trimming of branches, growing them and again pruning them as often as required to achieve the desired shape of the bonsai. Every pruning induces a change in the direction of the growing points. The use of wires is not allowed in this method. Whatever training to change the direction and angle is needed, it is achieved through repeated pruning only. In the olden days before the advent of copper or aluminium wire, the training of branches, especially in China, was done by the complicated process of tying palm fibres at several points on the branches and exerting a single pull or multiple pulls in the desired direction at any given point to effect a change in that direction. Usually a zig-zag pattern was achieved through the use of multiple palm fibres. When the bonsai starts shooting branches from all over, we are faced with one problem of making multiple decisions about which branches can be retained and grown, to what extent and, as a corollary thereof – which branches need to be removed and when. Depending on the style of the bonsai and the desired height, the primary branches will be those which are emerging from alternate points on the trunk. The decision to keep certain branches and removing others will depend on the location of the first designated primary branch which actually decides the height of the bonsai because ideally the first branch emerges from a point one third of the overall height of a bonsai. Once the first branch is decided, the pattern for the emergence of second and subsequent primary branches is set; they need to emerge from alternate points on the trunk in a decreasing spiral along the trunk with the second branch emerging from the side opposite and counterbalancing the first primary branch. Thus, the point of emergence between each successive branch gets lesser and lesser as the branches roll up the trunk. Further, the points of emergence of all primary branches should be such that each branch can be clearly visible, if seen from above, or in other words should not shade each other. [NOTE: a branch which is shaded by another branch tends to weaken and eventually die because it does not get adequate sunlight]. The branches which do not emerge from the desired locations as above should be removed as early as possible to avoid scar-marks. In the absence of a suitable branch at a desired location, a nearby branch would need to be retained and wired into position. The degree to which the branch is pruned back depends once again on – the position of each branch and the function of the available sub-branches on each branch. At the apex or nearer to it, the branches and shoots are pruned more severely than the successively lower branch as allowance needs to be made for apical dominance. All branches should never be pruned to the same degree on the entire tree in order to maintain the cone of vigour in lower branches. 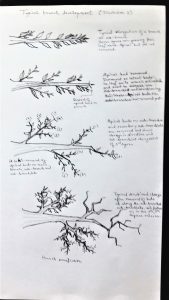 Most pruning should influence an angle change in sub-branches and branchlets to achieve an interesting branch silhouette. 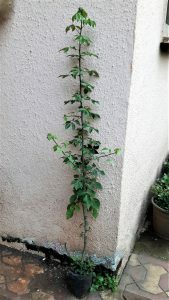 If a plant is too tall, reduction of the height may be necessary in order to induce taper or to bring the height in conformity with the lowest workable branch. In such cases, the height is reduced at a point lesser than the ultimate desired size and a suitable side branch is brought up as a substitute apex. Similarly, if the length of a primary branch is more than necessary, it is shortened to a length little lesser than the desired length and a suitable side branch is wired into position. Branches are pruned in such a way and such a time that each sub-branch and branchlet spreads out in a fan shape and successively reduces in thickness and internodal distance. Wiring is carried out if necessary and over-crowded areas in branches/sub-branches are thinned or where a node throws out multiple shoots from any point, these are reduced to two which are placed in the required directions influencing a directional change or are wired into required positions if necessary. 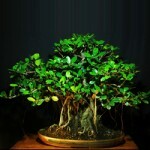 A very mature and well-developed bonsai will have a number of branches already spread out in fan shapes and will require refinement of its growth and foliage. However, thinning and selective pruning will have to resorted to at this stage. Pruning just beyond buds that point in desired directions will cause latent buds immediately below the cut to grow and put out two or more shoots. Of these shoots, the two which cause a change of growing direction and which grow sideways and upwards have to be retained and allowed to grow while the others are removed entirely to avoid future over-crowding and confusion. The second and subsequent flushes of latent buds which grow into shoots when the first or second shoots are cut back just above the desired leaf on the previous shoots and two shoots from each are retained and allowed to develop, we have a situation where the two shoots retained and grown from the latent buds from the first cut divide collectively into four, the four further divide into eight as in their time and turn they are pruned in the successive growing season, allowing the buds in the desired direction to develop and pruned again to achieve further change in direction, as desired in the next suitable growing seasons. In this manner, sub-branches along the primary branches will fork and divide and increase almost arithmetically and each sub-branch and successive forking junction will reduce gradually as the branches extend away from the trunk. Each fork will change the direction in which the sub-branch or sub-branchlet grows. In a nutshell, when pruning for ramification the sub-branch is cut just beyond the ninth leaf, the sub-branchlets growing from it should each be pruned shorter and shorter, say, after the seventh, fifth and third leaf, towards its outermost tip and so continued to the growth of the next set of leaves as well as branchlets which become refined with each successive pruning in successive growing seasons. It should be kept in mind that each lower branch is to be pruned less severely than each successively higher branch so that branch lines remain extended in the lower regions. In any given plant, food for growth is basically manufactured by leaves through photosynthesis. In good sunlight, Sugars and Carbohydrates are produced by the plant in adequate quantities with the help of the Chlorophyll manufactured in the leaves (Process of Photosynthesis). Oxygen is obtained from both the atmospheric carbon dioxide and from the soil. The water (H2O) absorbed by the roots and carbon dioxide (CO2) absorbed by the leaves are split into hydrogen & oxygen and carbon & oxygen respectively with the help of chlorophyll which is in turn produced only under sunlight. As a result of this splitting, hydrogen combines with carbon dioxide to form a sugar compound through photosynthesis and in the process oxygen is released as a by-product. Sugars are converted to energy to help the plants in their vital activities and drive it to grow. Oxygen required by the plants are mainly obtained by the roots directly through the fresh air present in the soil and not through water. Absence of oxygen in the soil results in anaerobic respiration of roots leading to production of Ethanol (alcohol) resulting in poor root growth and root rot. Root rot is literally Ethanol poisoning caused by lack of oxygen in the soil. The mineral salts, nutrients and elements absorbed by roots assist the plant in photosynthesis, production of carbohydrates and proteins (enzymes), development of flowers, fruits, leaves, roots, seeds and the general maintenance of good health. These nutrients which are transported to the stem, branches and leaves through the water are used to create and maintain chlorophyll but do not contribute to vegetative growth directly; (that is the function of plant food, viz., Carbohydrates and sugar). The better the absorption of water, oxygen and nutrients, the better will be the health of the plant. But sufficient light is necessary for photosynthesis and the efficient carrying out of the vital functions of the plants and their sustained growth. The activity of churning out sugars and carbohydrates is carried out by the leaves only in the daylight hours through photosynthesis. Leaves are covered on the underside by an epidermal layer pierced by many stomata or spores for breathing and the upper surface or epidermis is covered by a waxy cuticle or coating which prevents moisture loss; both these epidermal surfaces between them protect the mesophyll which contains the chloroplasts that are necessary for photosynthesis which is the primary function of leaves. Lower levels of sunlight in winter induces deciduous trees to shed their leaves in temperate climates and in tropical regions as well where the climate is cooler; temperate trees also go into dormancy or hibernate in winter due to extreme cold weather but trees in tropical climates, although they shed leaves, recover almost immediately due to the absence of a really cold climate. In other words, trees in tropical climates do not have a marked dormant period; but sometimes in extreme heat conditions, their growth may slow down a bit as if they are in a dormant condition. Transpiration: It is the process by which water absorbed by the roots is drawn up to the stem, branches and leaves. The continuous evaporation of water from the stomata during the daylight hours is what causes the movement of water from the roots to the leaves. Respiration: The conversion of sugars into energy necessary for carrying out the vital functions of the plant by breaking down the sugars with the help of Oxygen absorbed by the leaves takes place day and night and is called respiration. Nitrogen (N): It is essential for rapid vegetative growth, formation and functioning of chlorophyll, syntheses amino acids which in turn form proteins, regulate uptake of nutrients and 9t is a basic ingredient of vital compounds – nucleic acids & enzymes. Phosphorus (P): It stimulates early root formation and growth and helps soil to efficiently pick up other plant nutrients and water, improves stamina of plants, hastens maturity (converting starch to sugars), causes energy transformation and conversion processes in which sugars are converted to hormones, proteins and energy to produce new leaves and fruits, stimulates blooming and seed formation, forms nucleic acids (DNA & RNA), photosynthesis and cell division. Potassuim (K): It helps in the development of stem and leaves, increases disease resistance and hardens and strengthens cell walls, affects water intake (absence of K will cause wilting of cell walls in the presence of excessive moisture), acts as catalyst in Iron (Fe) intake, is essential in formation and translocation (movement) of proteins, starches, sugars and oils, improving size and quality of fruits, etc. Sulphur (S): Is a constituent of the three amino acids, essential for protein formulation, helps maintain the green colour of leaves, improves alkaline soil and de-compacts soil. Of the two forms of Sulphur, Sulphate Sulphur (SO4) helps reclaim alkaline soils and makes them loose and friable, also causes small soil particles to flocculate (join together in small crumbs) leaving small spaces for water and air circulation. Iron (Fe) – essential for chlorophyll formation; Zinc (Zn) is essential part of several plant enzymes and is a part of auxins which regulate growth compounds and affects use of water; Manganese (Mn) acts as activator of enzymes, without manganese, plants cannot use chlorophyll. Molybdenum (Mo) is essential in enzyme systems and protein synthesis. Chlorine (Cl) helps in correction deficiencies and by supressing many disease organisms. Cobalt (Co) fixes atmospheric Nitrogen (N), especially in legumes. Vanadium (V), a comparatively new find, plays the role of improving the quality and yield. Micronutrients are required to be maintained in balance so that all nutrients and water are used efficiently. The application of fertilizers is dictated by the goal we have in mind: a) whether gross development and growth is required or b) whether the tree is in an intermediate stage where it is developing but also in training for shape or c) whether it is already in the desired shape and is under refinement. For developing the trunk, branches and expanding the periphery of the tree, heavy fertilizing with high quantity and high frequency (weekly to fortnightly) will be required. For an intermediate stage tree, medium dosage and medium frequency (monthly or 45 days) will be required. For a tree which is in refinement, a lower dosage and lower frequency (tri-monthly). The quantity of fertilizers will differ from type to type and according to whether it is organic of purely chemical. But generally, chemical fertilizers are more potent and quick-acting but they also tend to build up salts in the soil which sometimes is harmful to the tree or which sours the soil in the long run. Organic fertilizers, on the other hand are comparatively less potent, are considered to be slow-release in action and do not harm the soil although, when manures are used they tend to pulverise and clog the drainage in the long run. As such, it is advisable to use a judicious of both types of fertilizers and apply chemicals at half strength or half the recommended dosage. If, for no apparent reason it is not growing as well as it should, indicating some problem in soil composition or drainage. In my opinion (validated by Ryan Neil of Bonsai Mirai in one of his live programmes and also by the practice followed by Indonesian masters) a bonsai need not be repotted unless it is absolutely necessary under the above conditions. The process of potting which invariably involves the removal of old soil and also roots to a lesser or greater degree traumatizes tree and sets its growth back for some time to come. This will hold true in both temperate and tropical climates and for almost any variety of tree, whether deciduous or evergreen. Reduction of roots needs to be accompanied by removal of unwanted top growth to balance the equation between foliage and rootage. [I have already written elsewhere about some of the precautions that need to be taken while repotting]. Repotting of trees need not follow a schedule. However, it may be said that tropical varieties growing in tropical climates where most plants grow faster than those in temperate climates per se, trees growing more vigorously would need more frequent repotting than varieties growing less vigorously. Further, younger trees or those in initial and intermediate developmental stages may be repotted more frequently or can also be overpotted; whereas trees in refinement stage need to be repotted less frequently and only in a proportionate pot, so as not to induce coarser growth on branches already being trained for refinement. It has been my longstanding assumption and assertion that soil is the single-most important factor in the successful growing of bonsai. There are as many recipes of bonsai soils as there are bonsai practitioners in the world. But I think all will agree that the best bonsai soils need to be those with the best long-term water draining capabilities. This is borne out by my observation during my recent viewing of the WBC convention at Saitama Japan. I observed that the soil used while potting a few of the demo trees that only a single ingredient of uniform particle size was used, although a drainage layer of coarser particles was used at the bottom of the pot. There are three major soils used in Japan: Akadama, Kanuma and Aoki. But they are used neat, i.e., only the single unmixed ingredient – I think Akadama is used for conifers, Kanuma for azaleas, etc., and Aoki probably for other deciduous trees. In Indonesia too, where they grow a lot of tropical varieties, I had observed in 2015 that they use lava rock crush neat as bonsai soil. In his book “The Beginners’ Guide to American Bonsai”, Mr. Jerald P Stowell says that soil screened into various sizes and put into a container in layers or strata, as recommended by most Japanese texts, has a greater capacity to hold both air and water than uniformly blended soils (soil with mixed particle sizes). Fine particles hold more water than coarse particles because fine particles have greater surface tension (due to more surface area) and therefore have greater capillary action. Both these factors exert greater force to retain water than gravity does to move it downwards (percolation) as it cannot pull water downwards from a layer of soil if it is merely moist; only when the soil layer is completely saturated will gravity force the water to move downwards to the lower layer of soil. Water which saturates a particle will collect at its bottom (almost like a drop) and move downwards to the next lower particle due to gravity and so on till it reaches the bottom of the pot. In stratified soil where the particle size graduates from smaller particles at the top to the largest particle at the bottom, the soil will hold twice as much water as compared to uniformly blended soil. Further, this also ensures excellent drainage and more pore spaces between particles. As against this, in a blended soil smaller particles occupy spaces between larger particles thus hampering water and air movement. Secondly, in stratified soils the movement of water between the interface of any two layers of soil (with same particle size in each layer, water percolates with difficulty to the lower level due to stronger capillary action in smaller particle size in each upper layer as compared to each successive lower layer. Under the circumstances, each layer must become and remain saturated before water will move into the next lower layer until the largest particle layer is becomes saturated. What it means to us is that, in stratified layers of bonsai soil in a pot there is much more open space which, when not filled with water is filled with air which is essential for healthy roots. The sifting of soils and its use in layers provide ample air to the roots, extra water to compensate for large transpiration loss and, a favourable soil climate for absorption of nutrients and optimal growth. In India, with most growers there is a tendency to use mixed or blended ingredients with a higher percentage of finer particles of garden earth and to a lesser extent pulverized manure which has a good Cation Exchange Capacity (CEC or ability to absorb nourishment and release it when needed) and sand or a substitute. Most ingredients, if they have a lower tensile strength (hardness of particles proof against pulverization) tend to pulverize further and quickly, leading to soil compaction and the use of a high content of fine particle size aggravates the matter, hampering drainage almost as soon as they are potted or repotted. It would be better to use a single ingredient with high tensile strength and larger particle size (7 to 10 mm) especially for larger pots. 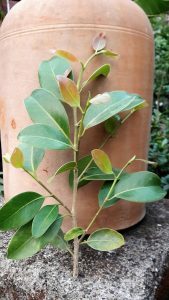 However, when flowering or fruiting varieties which need humus rich soil and aesthetically larger pots are grown as bonsai, it may not be possible to use a solitary ingredient in bonsai soil in tropical conditions. In such cases, use of a good proportion (about 50%) of ingredients with good tensile strength to compensate for the loss of drainage capacity through the use of mixed ingredients containing humus. So, in effect, we have two options: a) Use stratified layers of soil with smaller particles (not less than 5mm) on top and largest particles at the bottom of the pot, which is a tried and tested method. This will ensure that the trees get adequate water and air for prolonged healthy growth. b) Use a single ingredient of good tensile strength and of nearly uniform particle size (minimum 5mm or 7mm or 10mm, depending on the pot size) in the bonsai soil without mixing any other ingredients that might pulverise and compact earlier than the main ingredient. This would help the plant to grow healthily & strongly and unhampered drainage would not remain a troublesome factor in the long run. As a general rule, we should avoid ingredients such as clayey or loamy soils which tend to clog the drainage holes or compact easily. The general precaution that needs to be taken while potting / repotting bonsai would include doing it in Spring or any season suitable to the species, using even particles of soil with good tensile strength, avoid using very fine particles in the soil and using an appropriate pot depending on whether it is a developing or refined bonsai. So, to sum up this first of a series of articles, I may say that if we design bonsai aesthetically, use good soil, prune and wire optimally considering the time factor, in short, work meticulously and diligently and generally maintain the good health of our bonsai by giving adequate water and sunlight, timely nourishment in required quantities and follow sound horticultural practices, we would stand a good chance of achieving a measure of that perfection we all seek but seldom find.